Some time ago, HIPRA took an important strategic decision: to develop and manufacture its own medical devices for the most correct administration of its vaccines. Coccidiosis in chickens is one of HIPRA’s strategic areas where it has recently launched a new and innovative coccidiosis vaccine, EVALON®. For this reason, the development of Hipraspray® was a natural consequence and is now a reality. In terms of prevention against coccidiosis in chickens, Hipraspray® represents a turning point and a major leap forward in the use of vaccination devices. With this system, HIPRA offers a high performance vaccination device specifically designed to ensure maximum efficacy of its EVALON® and Hipracox® products. In addition, HIPRA brings benefit to both the hatchery and the final producer. HIPRA has enhanced its corporate strategy to overcome both current and future challenges. HIPRA is the first company to have digitised the animal health vaccination process, through Smart Vaccination. In light of the desperate need for parameter optimisation in the livestock farming industry, HIPRA has emerged as the leader in the traceability of vaccination processes. In this regard, HIPRA deems transparency from hatchery to the end producer to be vital, offering more information concerning the vaccination process against coccidiosis in chickens to all parties involved. This is ensured by software called HIPRAlink®, a platform for tracing, managing and analysing all the data coming from the vaccination process. With HIPRAlink®, it is possible to trace information such as the doses administered, details of the vaccine batches, details regarding the operation and use of the Hipraspray® device, and to add more information that is of interest to the final producer about the batch of vaccinated chicks. Biological products –and especially vaccines against coccidiosis in chickens- are extremely complicated to administer, which is why a fully coordinated and parallel approach to both vaccine and device production is vital in order to guarantee the best return on investment for the end customer. With a view to generating as much information as possible about the vaccination process and the products used, HIPRA opted to insert RFID chips into the vial labels. The coccidiosis in chickens line of vaccines –EVALON® and HIPRACOX®– was one of the first to carry these chips in the labels. This has revolutionised the production process and the production lines in particular. This has been achieved thanks to the company’s flexibility, ability to rapidly adapt and the optimism with which it approaches new and exciting challenges. HIPRA’s future looks bright and is full of new challenges in such novel areas as traceability of livestock production processes, the Internet of Things (IoT), Big Data and decision-making, as well as artificial and predictive intelligence in diagnostics, while continuing to offer innovative and exclusive services to its customers. Everybody knows that to get milk from dairy cattle, the cow has to be milked. Use of milking machines is the easy way to rapidly and efficiently remove the milk without damage to the teat or gland and with minimal risk of the transmission of pathogenic microorganisms that might cause mastitis in cattle. Knowing the milking machine is basic to prevent mastitis in cattle. • Removal of milk from the cow by vacuum differential. • The milk then flows to the receiver jar by gravity. • The milk is pumped from the receiver jar into the bulk tank. 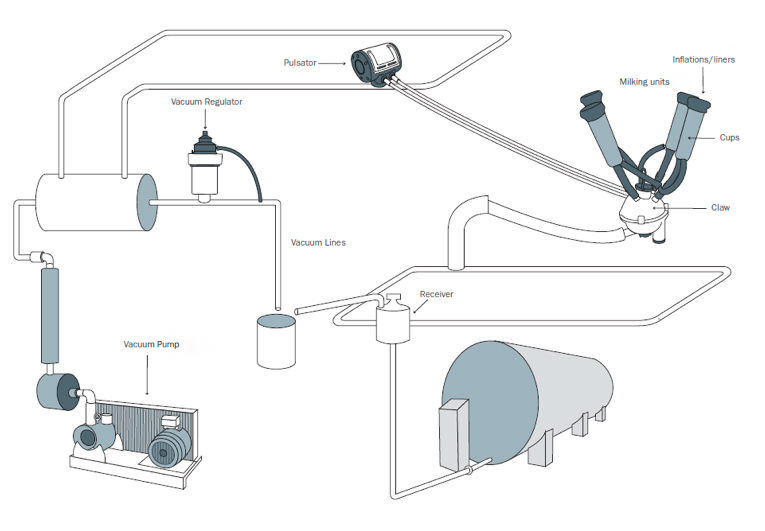 These are the six basic parts of a milking system. In order to avoid the risk of contagious mastitis in cattle, all of them need to be kept under constantly reviewed and they should be replaced if necessary. • Vacuum pump: The pump removes air and creates the vacuum. • Vacuum regulator: The vacuum regulator admits atmospheric air in and out of the system to keep the vacuum at a predetermined set level. If the vacuum gets too high, the vacuum regulator will open and let air into the system to lower the vacuum. • Pulsator: The function of the pulsator is to allow intermittent massage of the teat end to prevent swelling and avoiding possible lessions in the teat that may end up in mastitis in cattle. It does this by alternating between a partial vacuum (milking phase) and atmospheric air pressure (massage phase). Pulsator ratios of 100%, 50/50, 60/40 and 70/30 are typical ratios. The first number refers to the amount of time the pulsator draws vacuum to open the liner and withdraw milk. The second number indicates the amount of time it admits atmospheric air to collapse the liner and massage the teat. Uniform pulsation milks all 4 quarters simultaneously. Alternate pulsation milks two quarters at a time, while the other 2 quarters rest. Dual pulsators allow the quarters to be milked at different ratios, such as 60/40 behind and 50/50 in the front quarters. • Receiver: Milk flows by gravity through the milk line and into the receiver jar. The receiver jar serves as a small holding reservoir until the milk can be pumped into the bulk tank for cooling and storage. The valve between the receiving jar and the milk pump should not admit air. If a bubbling action occurs in the receiver jar, air is leaking past the valve and it should be corrected or replaced in order to avoid the risk of contagious mastitis in cattle. • Milking unit: The machine includes teat cups that are in contact with the cow’s teats and remove the milk, a claw where milk pools as it is removed from the four teats, vacuum tubes that provide vacuum to the teat cups and a milk tube that removes milk away from the claw, a source of vacuum for the machine. Connecting tubes are divided into short milk tube (liner to claw), long milk tube (claw to milkline), short pulse tube (shell to air fork) and long pulse tube (air fork to pulsator). Authors: Nicola Rota (Udder health and milk quality consultant). ENVIRONMENTAL CONTROL (IV): PREPARING YOUR HERD AGAINST BOVINE MASTITIS DURING LACTATION. Dry cows are often the forgotten cows, and the environment has huge effects on bovine mastitis. Therefore, prevention of bovine mastitis by environmental bacteria starts with dry cows. You’ll find in this post valuable information regarding the environment in dry cows and regarding how to prepare your herd in order to avoid bovine mastitis infections during lactation. Dry cow pens are sometimes the forgotten pens, because they do not produce milk. This is a great mistake, since many new clinical cases that occur during the first 100 days in milk originate in the dry period, as reported in scientific studies. Cases of bovine mastitis infections on the dry period vs on lactation. Adapted from A. J. Bradley. Vet Clin Food Anim 20. (2004) 547 568. We can therefore say that prevention of bovine mastitis by environmental bacteria starts with dry cows. From a milk quality standpoint, we tend to say that new lactation does not start when the cow calves. It starts when that cow is dried off. The highest risk of new infection is just after drying off and around calving, as shown in the graph below, so environmental conditions in dry cows and close up cows must be at least as excellent as for the lactating animals. Rate of bovine mastitis Infections (Dry Period vs Infection). Adapted from A. J. Bradley. Vet Clin Food Anim 20 (2004) 547 568. Regardless of the bedding used, design, stocking density and maintenance play a huge role in environmental control of bovine mastitis in this kind of facility. Remember that we have to provide a clean, dry and comfortable environment for the cows if we want to make them perform correctly. In terms of milk production, but also for control of diseases such as bovine mastitis or lameness. A poor freestall design will compromise cow comfort and will make it more difficult to keep bedding clean. If freestalls are not comfortable enough, cows will look for another place to lie down, such as in the alleys. A poor freestall design will make it more difficult to keep bedding clean and thus, to avoid bovine mastitis infections in dairy cows. As regards density, for pens with freestalls, the rule of thumb is one freestall per cow in the pen. Despite this, we can find farms working with 2-5% extra cows with no problems. Obviously this situation is not advisable, but we do find it on some farms. At this point, excellent bedding maintenance is absolutely essential. More than 5% overdensity will lead to environmental problems. These recommended areas are useless if good maintenance and excellent ventilation are not provided. Also, heat stress will play a major role in bovine mastitis if the cows are not distributed evenly along the pen. When cows suffer heat stress they tend to group in one area of the barn. Usually where the main wind comes into the barn, but sometimes they group in a corner just because they are stressed and they react as some ruminants do in the face of a stressing situation, by grouping. The bedding in these areas becomes very wet and dirty and it became an important source of bacteria that may cause some health problems such as bovine mastitis. We can see the same situation when we have a great many flies in the barn. Flies are extremely annoying for the cows and must be controlled in order to prevent cows grouping. Water trough location is also very important. It is common in old facilities to find water troughs inside the bedding areas, producing very wet areas surrounding them, especially in summer time. The areas around water points are also an important source of bacteria. For freestall pens, water points must be installed in the crossing alleys if a barn has 3 rows of freestalls. These crossing alleys should measure at least 4 to 5 meters in width. For a 2-row barn, the water point must be in the rear alley. For bedded pens, water points must be out of the resting area, in the alley. Also the rear part of the water point can be protected with a piece of stainless steel so as not wet the resting area. Correct ventilation is another important issue. As bacteria need humidity to grow, providing fresh and clean air will reduce the bacterial count of the bedding and the risk of these bacteria to grow and cause some problems like bovine mastitis. Cows will also distribute evenly all along the resting area. Of course, we must first increase natural ventilation, but also be prepared to install fans when necessary. Cows must be clean, dry and comfortable at all times. Choose the right bedding material. Inorganic materials are always better than organic if we are thinking about milk quality. Other factors such as availability, price and manure handling facilities will determine one material or another. Very good maintenance can reduce the effects of bad bedding material. Bad management can destroy the benefits of good bedding material. Proper management is the most important aspect of cows’ bedding. Cow hygiene is not a choice. It has to be a farmer’s commitment. Is Eimeria tenella properly diagnosed in poultry coccidiosis?